Dear members of the VanBaelenGuillot family, friends and followers! Welcome back! Last time we talked we picked up our car in New York and we were ready to attack the American continent! After picking up our car we went south to Baltimore to visit two Catalan friends who had just had their first baby! Sandra and Ignacio welcomed their baby Ignacio a few days before our arrival and were enjoying their first days as parents! Driving to Baltimore was pretty easy and did not cause any problem - even without a GPS!-Mireia is a very good copilote ;) -We arrived late in the afternoon so we searched a place to sleep: This would be our first camping experience in the USA! Our stop in a State Park turned out to be excellent: Beautiful camping spots, great accommodations, reasonable prices and great wild life! Only downside were the large amount of mosquito and the sweetness of our skins! Baltimore itself does have some less pleasant areas, but we mainly enjoyed the comfort and pleasure of our friends' home and our visit of Baltimore was limited to the center and the harbor. We were very lucky to park our car safely in a parking, as we wouldn't feel comfortable to leave it on the Baltimorean streets. After Baltimore we went to Boston, which is north of New York and around 700 km away so we had to make a pit stop in the middle. We made a quick stop in Philadelphia to see some of the main items. To be honest, it looked like a very nice place with a very good vibe, but we had to keep on moving to go to Boston were Marta and Iñigo were waiting for us (a very long wait of 2 days - sorry for that!!). 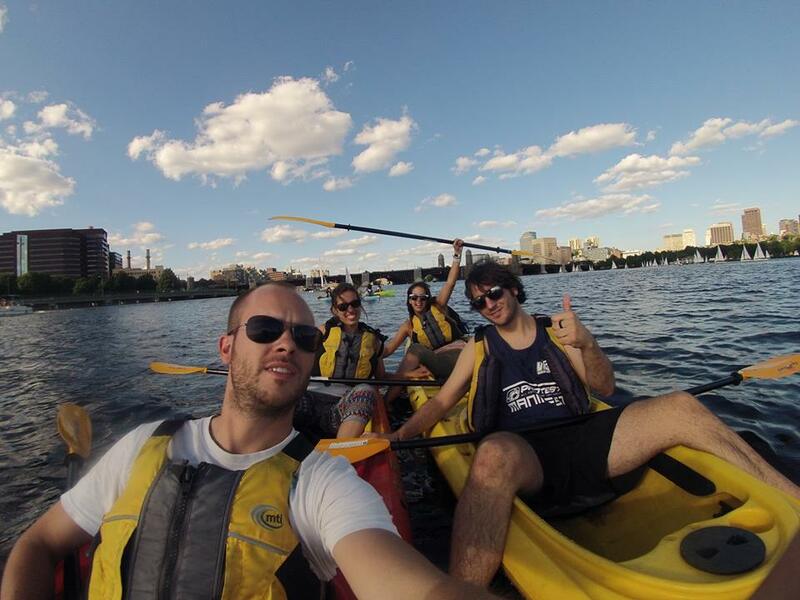 Boston is a vibrant city with a huge amount of history, many universities, affordable prices and a good atmosphere! It somehow felt a bit European and is very easy to explore due to the Freedom trail. This is a physical red trail running through the city which passes all main sights. It allowed us to visit the city in a couple of hours with the bikes of Chos&Iñigo). As we had some time, we could have a look at the electrical issues we had. After measuring everything and having a call with Peter, it appeared that the secondary batteries were simply to empty to charge and that's why we didn't have any power. So the solution was to connect the secondary batteries straight to the main batteries!! In addition Marta, who works for a Mountainbike firm in Boston (Montague), was able to help us get a sponsorship deal! We got two super cool mountainbikes which are foldable to take along on our trip. In return we regularly write for Montague's blog! A great win-win situation we think! Having spend several days in Boston we really had a great time, we met a lot of people, had much fun and saw the city from different angles (kayak, walking, biking...) Still the time had come to continue, so we left west to the Canadian boarder to visit the Niagara Waterfalls. The waterfalls lay on the American and Canadian boarders and can be seen from both sides. The falls are extraordinary and cannot be captured by pictures. They are so enormous (every second 2,5 million liters falls over the main waterfall, which equals the water within an Olympic swimming pool) and you would imagine that all this natural power would make much noise. Still the contrary is true: it's surprisingly silent and you don't need to shout to talk to each other. After having enjoyed the views from the American side we felt like crossing the bridge and entering Canada. Being by bike we had to pass the bridge together with the cars, which was no problem as the entire bridge was filled with cars who were standing in line at offices. Alex, spontaneous as he is, didn't seem to remember that you have to stop at a boarder and passed to boarder control at full speed with the bike. This was something that Mr Rambo at the boarder could not appreciate and after some serious shouting and threatening (we could have been arrested, we could have gone to jail and we could have had to pay a fine of 1000 dollar) we were allowed to enter in Canada to enjoy the beauty of the waterfalls from there. Thanks for reading so much, now the fun part: the pictures! It is necessary to say that Mireia is learning to use the camera and she is doing great pictures!! Waking up with this view - who would not be jealous? Extreme sport fan Inigo doesn't mind to do a back flip on the bridge! American style - Big iced coffee slurpee from Dunkin' Donuts - lekker lekker!! Me gustaa!! Sponsorship mountain bikes from Montague! Me habeis alegrado el dia. De rés ignasi!! gracies per llegir-nos!! Thanks for reading us! :-) We keep in touch! Chicos!! It looks like you're having great fun! I loved reading your stories! Pasadlo muy muy bien y seguid informando!!! Hope you can start your adventure soon and we can also read yours! I will continue reading to learn how this exciting adventure continues. Who knows if any other companies engage and sponsor your long trip. Hurrah Catalan and Flemish in the world. We keep in touch! thanks for following us! Mami! T'estimo momtissim! Cuida't molt! mireee!!! canadaa??? que va pasar? ?